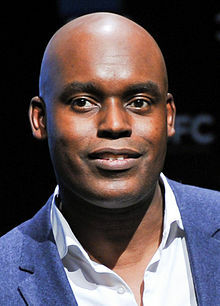 Cameron Bailey is a Canadian film critic and festival programmer. He is the artistic director and co-head of the Toronto International Film Festival (TIFF). Born in London, England to parents from Barbados, he spent his early childhood in St. James, Barbados, before moving to Canada with his family at the age of eight. Educated at the University of Western Ontario, he worked as a film reviewer for Now, Canada AM, CBC Radio One, Take One and other publications before joining the Toronto International Film Festival as a programmer. He also cowrote the screenplay for the 1997 film The Planet of Junior Brown with Clement Virgo, and wrote and directed the short film Hotel Saudade. In 2012, Bailey was named artistic director of the Toronto International Film Festival. He participated in the 2015 edition of Canada Reads, where he advocated for Kim Thúy's novel Ru. Ru ultimately won the competition. In 2018, Bailey was promoted to the newly created position of artistic director and co-head of the Toronto International Film Festival. Cameron Bailey (1990). "A Cinema of Duty: The Films of Jennifer Hodge de Silva". CineAction. winter (23): 4–12. In this essay he honoured Jennifer Hodge de Silva. ^ a b c d e "Movie mogul Cameron Bailey". Canadian Immigrant, October 3, 2011. ^ "Cameron Bailey named artistic director of Toronto International Film Festival". National Post, March 14, 2012. ^ "'Ru' by Montreal's Kim Thuy wins CBC's 'Canada Reads' competition". Brandon Sun, March 19, 2015. ^ Lang, Brent (2018-04-19). "Cameron Bailey Promoted to Co-Head of Toronto Film Festival". Variety. Retrieved 2018-11-14. This page was last edited on 30 March 2019, at 01:56 (UTC).